If you are going to be out of town on Tuesday, May 21, 2013 you need to vote by absentee ballot. The deadline to apply for an absentee ballot is Tuesday, May 14, 2013 at 5:00pm. 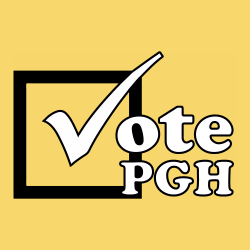 Get all of the details on applying for an absentee ballot at votePGH here. If you have not yet signed the votePGH pledge please take a moment to visit votePGH.org and sign the pledge. We are working to make sure we have at least 1 pledge from each neighborhood. Take a look at the neighborhood’s list here. We’ve got 50+ more neighborhoods that need to pledge.